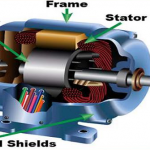 Synchronous motor construction is complicated. 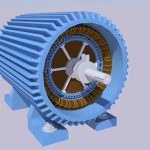 Induction motor construction is simpler, particularly in case of cage rotor. Separate DC source is required for rotor excitation. Rotor gets excited by the induced e.m.f so separate source is not necessary. The speed is always synchronous irrespective of the load The speed is always less than synchronous but never synchronous. In synchronous motor speed control is not possible. In induction motor Speed control is possible through difficult. As load increase, load angle increases, kipping speed constant at synchronous. As load increases, the speed keeps on decreasing. By changing excitation, the motor p.f can be changed from lagging and leading. It always operates at lagging p.f. and p.f. control is not possible. It can be used as synchronous condenser for p.f. improvement. It cannot be used as synchronous. 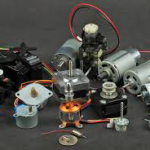 Motor is costly and requires frequent maintenance Motor is cheap, especially cage rotors and maintenance free.